It’s fitting that money forms the theme of many successful online slots. Ancient Egyptians and cute insects are all fine and dandy, but surely slots that actually show people with some moolah are the perfect inspiration for winning yourself. The slacker-done-good mayhem of Ash Gaming’s excellent Lotto-themed Midas Millions, or Playtech’s ‘does-what-it-says-on-the-tin’ money-themed Mr. Cash Back showed that it’s possible to celebrate money in slots whilst also poking fun at the kind of people who have it, and the kind of people it turns ordinary folk into. 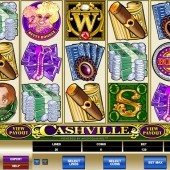 That is what makes this slot so appealing is that it doesn't take itself too seriously. 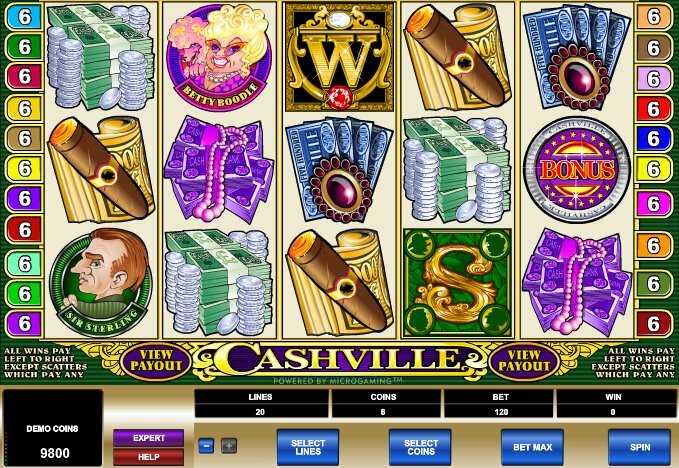 Cashville, from leading developer, Microgaming, certainly falls into a warm, cosy bed with those two slots, featuring characters with money-themed names like Bill Bullion and Sir Sterling, as we delve into the lives of the very rich. And with a top jackpot of 500,000 coins up for grabs, there’s the possibility you could be joining them. The reels are packed with gold hues and bling – jewelry, gold and jewels, plus cigars, cash, and the characters themselves: Sterling and Bullion, Bettie Boodle and Dame Von Deeds. The characters even talk! Look out for the golden W – it’s the game’s Wild symbol and substitutes for all regular money symbols only. Five Wilds pays out a nice little 50,000-coin jackpot. The Scattered S symbol will pay out a top whack of 300x your total bet if you hit five across the reels, but it’s the Bonus icon that triggers the game’s main feature bonus. B is for Big Bonus Win! Hit three or more Bonus symbols anywhere on the reels and you’ll get to choose rich men or women (three or more, depending on how many Bonus symbols you hit originally) who will lead you into a Pick ‘Em Bonus round. There are nine symbols to choose from – keep picking until you hit the ‘Collect’ button. With luck you could bag a 500,000-coin jackpot. With some nice jackpots on offer this game does appeal, although I probably would have liked to have seen a free spins bonus round to go with its fairly standard Pick ‘Em Bonus round.